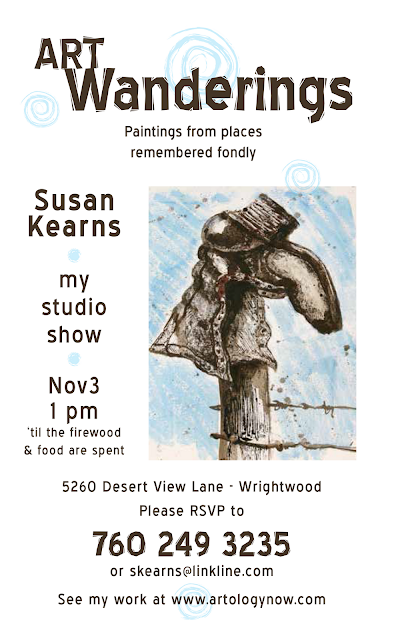 Well Art Fans, we are less than a week and a half away from my annual show. Nearly every painting is framed and arranged—except for these small four pieces. Remember this "quadtych"? 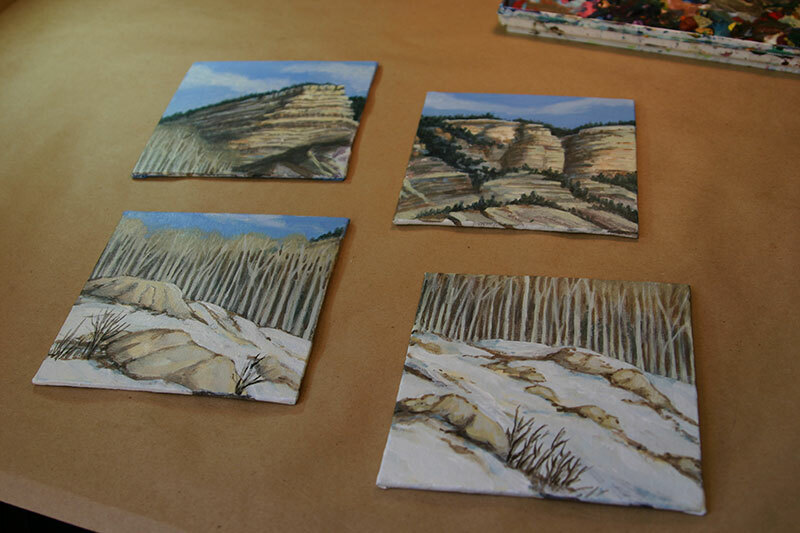 I love working with these small 5" X 5" canvases. A couple of years ago, my handy husband dreamed up a clever display method for these cute little canvases that I'd like to share with you. Borne out of necessity (a frame would cost how much? ), I love this simple, yet elegant solution. He cuts 3/4" X 3/4" strips of wood and joins them together to create a square. 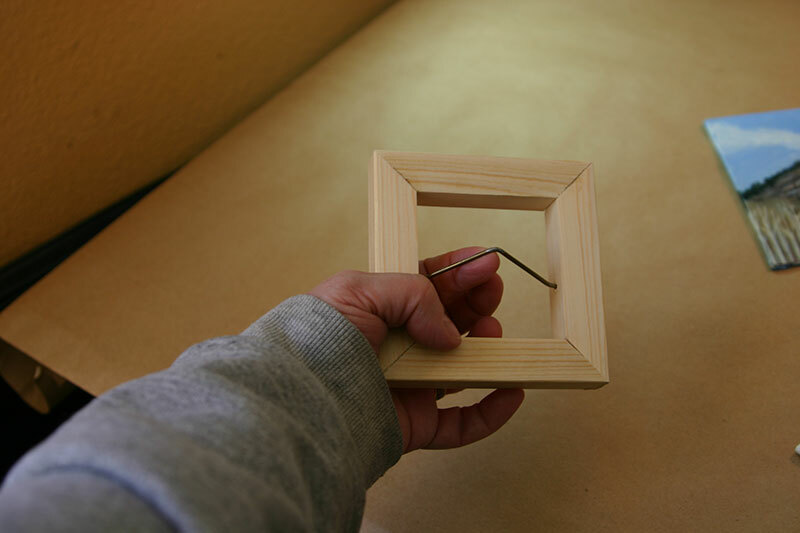 Then, he makes a hanger by bending a piece of metal (to just the right angle) and inserts it into the wood square. Once affixed to the back of the canvas, magically--ok, I know there are physics involved--the painting hangs flush to the wall. These "backframes" (which probably have a real name) give these diminutive pieces just the right amount of presentation panache. Now that Clint has done his part, I need to finish my end of the deal before he can mount the backframes onto the paintings. 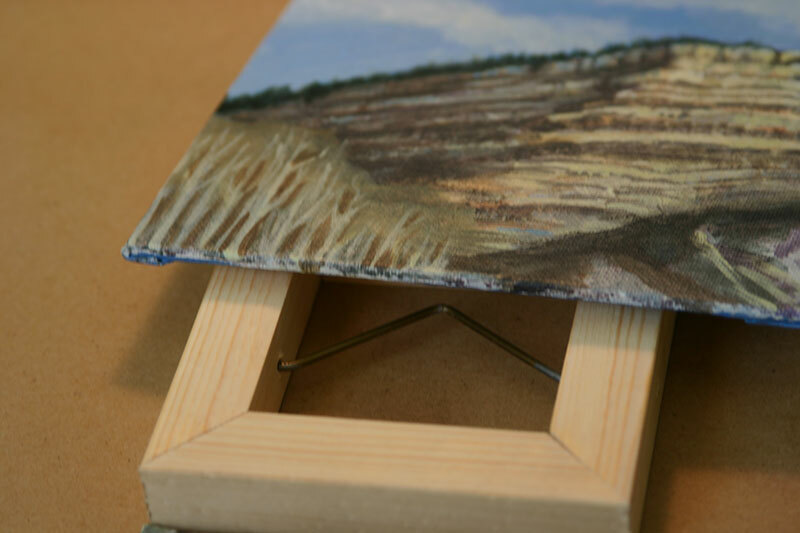 Since the pieces extend from the wall and the edges will not be covered with a frame, the raw edges must be finished off AND the backs of the canvases must be painted. So, I need to mix up colors to continue the images around the wrap of the canvas; and sign them, varnish them, and voila! When you are here for the show, be sure to take one of these off the wall and check out his handiwork. You are coming to the show, right? I'm excited to announce I've already made my first sale. Or pre-sale, I guess. 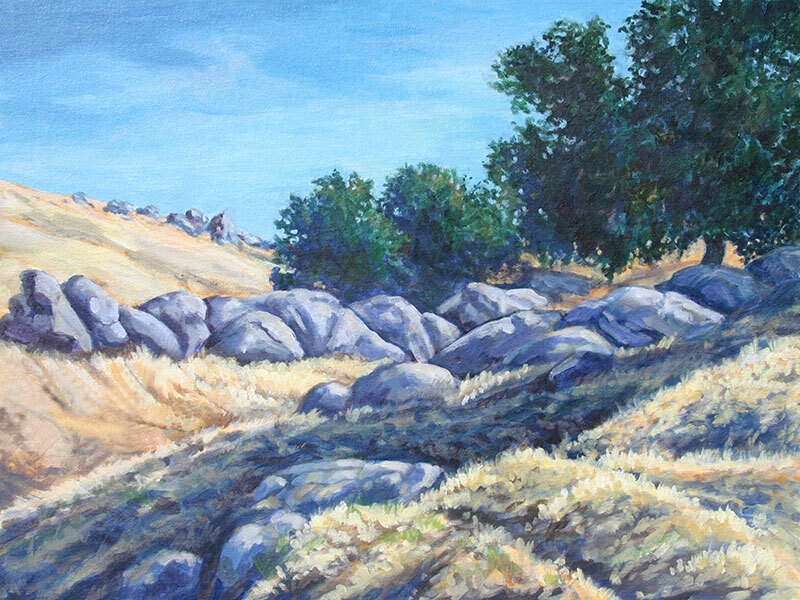 A good friend who isn't able to come to the show fell in love with one of the pieces I showed you here, California Dreaming. Now it's hers. Yippee! If there is a painting that has been haunting you and you cannot make it to my show (November 3, 1 pm), please contact me if you are interested. I know I’ve been MIA lately. Life has been hectic and painting time virtually non-existent. In the snippets of spare time I do have, I am preparing for the show—which will be FABULOUS! We’re coming up on the home stretch with the event now being less than four weeks away. We’re matting and framing and labeling and cleaning like crazy. Over the weekend, I created more than 75 greeting cards. This year you're going to see something very different. Each card is hand assembled with loving care. I don’t know what I was thinking—this really takes a lot of time! However, I think you will be pleased with the result. I would like to personally extend an invitation to all of you to my annual show. If for some reason you are not on my mailing list or want to be on my mailing list, or need directions to the show, please drop me an email at skearns@linkline.com.